Does your RV need some custom work done? Maybe you’d like to change the floor plan, or add a slide-out room to your motor home? Hancock RV Repair can build custom slide-out rooms. 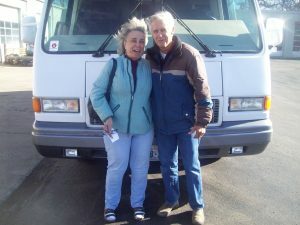 We make improvements to your Class A motor coach or any RV by redesigning the floor plan and adding slide-out rooms. Slide-out room repair and replacement. Custom repair and replacement of counters, cabinets, floors and built-ins by Hancock RV Repair. 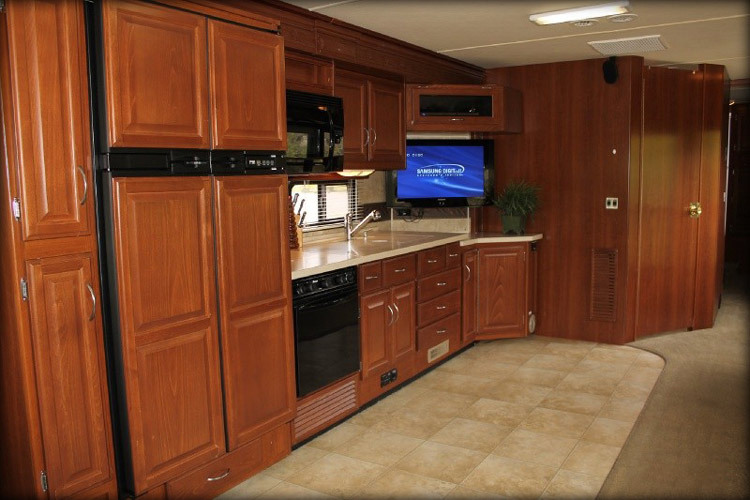 Cabinets – Your RV Repair may involve new cabinets. We can install them to revive the interior of your unit. 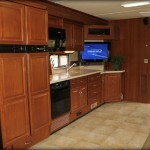 The interior of your RV will receive all of our attention. We are experienced in rubber roof replacement. Your RV repair isn’t complete until you protect that investment with a quality rubber roof. We can also repair existing roofs. No need for replacing the whole roof! Collisions happen. When they do we can handle the RV repair needed to get you back on the road! When it hails, your AC unit, roof, windshield and many other components may be damaged. We can fix those damages and get you back to camping. We can run new electric and plumbing in your RV. Whether it is just replacing the old, or part of a complete RV interior redesign, we can handle it. With our experience, be sure that it is done right! When your cap and / or sidewalls have sustained damage, we can replace those broken parts and renew the original look of your unit. 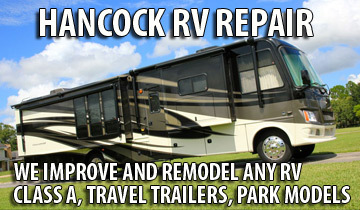 Hancock RV Repair can handle your insurance repairs, and get you back on the road.